This past week was my first week of classes. It was probably the very first time in the past three years since starting college that I was not stressed out about homework. I truly mean the first time ever. It was so strange that I started stressing because I did not have much to stress out about. The first week back is called “Refresher’s Week,” as the first-years here are called “Freshers” and they need a refresher on how to get back into the routine of school. There are nightly activities all leading up to the Refresher’s Fayre on Sunday, which is an activities fair where you have a chance to see and sign up for all of the different clubs, called societies, that the school offers. Much of my week was dedicated to figuring out how my classes work and getting a feel for what a typical school week will be like. To start off, I am taking three modules: International Trade, Mathematical Modelling, and Scottish Music. International Trade is a typical economics class that analyzes the way trade is conducted around the world. Mathematical Modelling is similar to differential equations, but using the ideas from that subject and applying them to real-world problems. Scottish Music could potentially be the hardest module I have, which was a little shocking to me. It is treated more as a history class than a music class, but we do get to learn how to play the penny whistle! The module focuses on analyzing the history of Scottish music and the influences that helped create it. Each of the modules are broken down into a series of different classes called lectures, tutorials, and in math only, computer lab and examples classes. Every week, for each class, there are lectures. 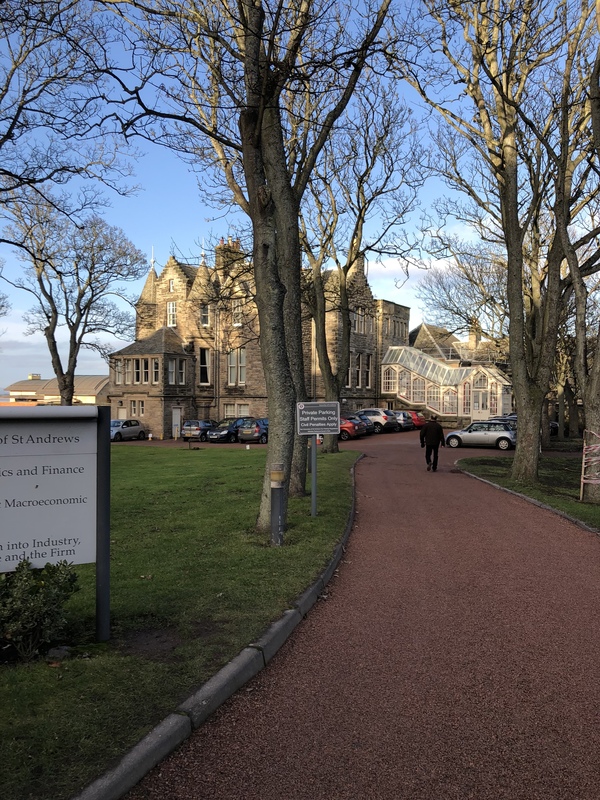 They vary in frequency and length, as I have 2 or 3 math lectures a week (all depending on the week) for 50 minutes, 3 lectures for Scottish Music for 50 minutes a week, and 1 two-hour lecture for International Trade a week. It is a bit strange to only have 1 economics class all week, but it does give me time to prepare for the lectures. Lectures are where the professor teaches the material. There is no homework assigned or turned in during lectures. Lectures are just there for everyone to learn the material. There are many students in one lecture. My largest class is International Trade, which has about 70 students in it. Math is about the same and my smallest is Scottish Music, which has around 30 students. This is something that I am not used to at all, since Whitman tries to keep the number of students to less than 40 in a class. It was a little intimidating, but since all lectures are designed to just go over the material, it was not as bad as I originally had thought. 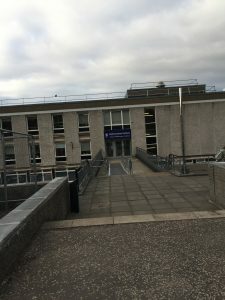 Tutorials are where the class is broken down into groups of 10 to 20 students and typically meet every other week, except for Scottish Music that meets every week. This is where we are assigned homework and are expected to complete it before class. It is designed to be a time to ask questions and look deeper into the material. I will have my first set of tutorials in the next two weeks and I am eager to see how they work. Unique to math classes are computer labs and examples classes. Math has tutorials as well, but the computer lab and examples classes have around 45 students in each and are designed more as a peer-collaboration time than tutorials. Examples classes allow you to work with other students on problems and ask for help when needed. The computer labs only occur from weeks 5-9 during the semester and will be used to work on a computer assignment for the class. The way that grades are determined and the number of assignments per class are a lot different than I am used to as well. For all of my classes, the final exam is worth at least 50% of my grade, with the most being 70% of my grade. There are very little assignments as well. International Trade has one class test, one essay, and the final. Scottish Music has two essays and a final. Mathematical Modelling has 4 assignments and the final. This is the first math class that I have ever had that does not have any tests throughout the semester. It is a little daunting that so much is weighted on the final, but they do have good resources in order to help you prepare for it. My class locations are also starkly different than I am used to. At Whitman, all academic buildings (with the exception of the Music building), are circled around Ankeny. Here, the school is split into multiple different areas. 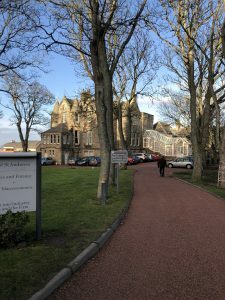 There is St. Salvator’s College, which is the considered the “main” campus, is home to English, Classics, Economics, Art History, and Music departments. There is St. Mary’s College, which is home to the Psychology, Sociology, and Philosophy departments. Both St. Salvator’s and St. Mary’s Colleges are located in downtown St Andrews. The Math and Science departments are all in the North Haugh, which is also where my dorm is located. This is about a 20 minute walk from downtown St Andrews. Because I am taking a mix of subjects, I have two modules in St. Salvator’s and one in the North Haugh. This means that it takes me 20 minutes to walk to my classes in St. Salvator’s, or Sallies as it is known. This is a lot different than the 5 minutes it takes me to walk to class at Whitman, but the view is great. 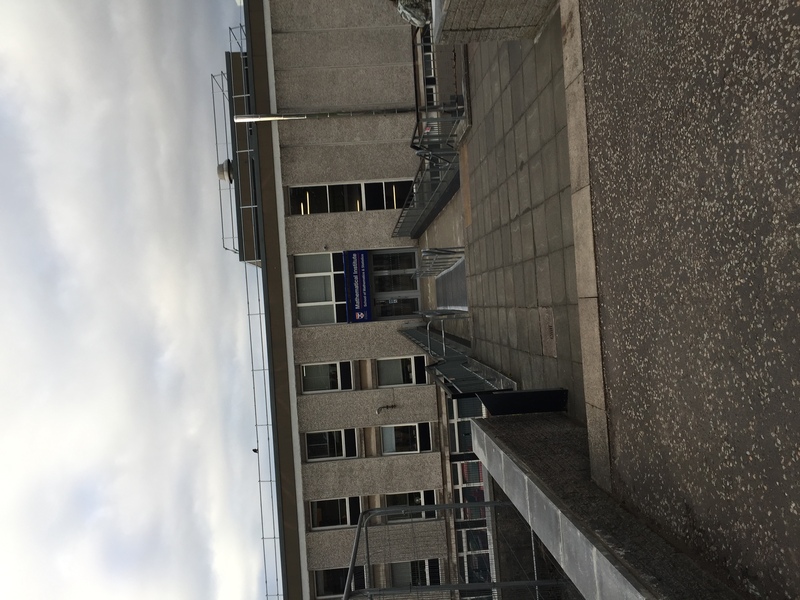 My economics tutorial class is in the Economics department building, known as Castlecliffe. The building is literally on a cliff, overlooking the sea. It is very beautiful. My lectures for International Trade and Scottish Music are in St. Salvator’s Quad, which is what is used for many of the promotional pictures for the college. I then get to walk back to the Mathematics building, which is right next to my dorm. The Maths Building (it is actually very nice on the inside). 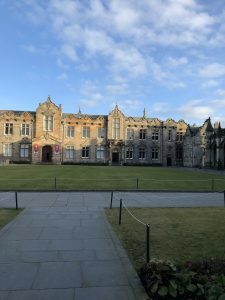 The Quad is the central hub of the academic buildings and St. Salvator’s Chapel is to the right as well. Overall, the first week of classes went well, but there is still much more to come. I will still need to get used to my ever-changing schedule each week and factor in the length of time it takes me to walk to my classes. The subjects that I have chosen to take are interesting and exciting and I hope that I am able to learn more about topics that I do not have the chance to learn about at Whitman. Understanding the new system is my next challenge, but I am eager to see what opportunities it gives me. This entry was posted in Uncategorized on February 4, 2018 by erindenney.